So I thought about a skirt with my stash of Elsebeth Lavold's black Silky Wool. I was warned that the Silky Wool yarn wants to grow, so I had second thoughts. I noticed that the swatch lacked elasticity to some extent, which means that it might stretch, but not necessarily grow. I figured to take care of that with negative ease at the waist. The skirt will not be fitted elsewhere. It is meant to be full and knee length. Here is a sketch - not a good scan, but it gives the idea. The body of the skirt will be stockinette, but since that curls, the bottom is banded with about 2 inches of moss sitch. 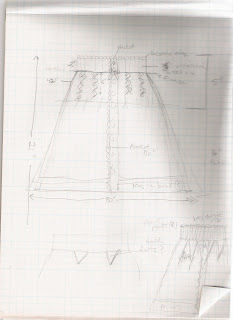 The top will be shaped by inverted pleats with stockinette on the outside and reverse stockinette on the inside. Does any of this sound familiar? Yes, it's Darcy revisited . For the rest, there will be a front placket, maybe in moss, with buttons that will probably be snaps in reality and a 1x1 (twisted?) ribbed waistband of about 2". The band will be higher than the actual waistline and will probably have a tie at its lower edge. I am almost embarresed to say it, but would any other knitter on earth cast on and moss stitch 528 stitches? Now it is bottom up and will decrease as I go, but still. The original idea for this skirt was actually for a thick yarn and not as full. If I reknit it that way and it makes a worthwhile design, I would post it. The book I'm listening to now is George Pelecanos' Drama City about the DC underworld of drugs and dog fighting. Isn't Drama City a great name for a skirt?